The FARLAND Outdoor Camping hammock is for someone that wants something that will remain in good shape for a long time. It comes in single and double sizes, and the company makes it with a 210T parachute fabric that is breathable, durable and lightweight. 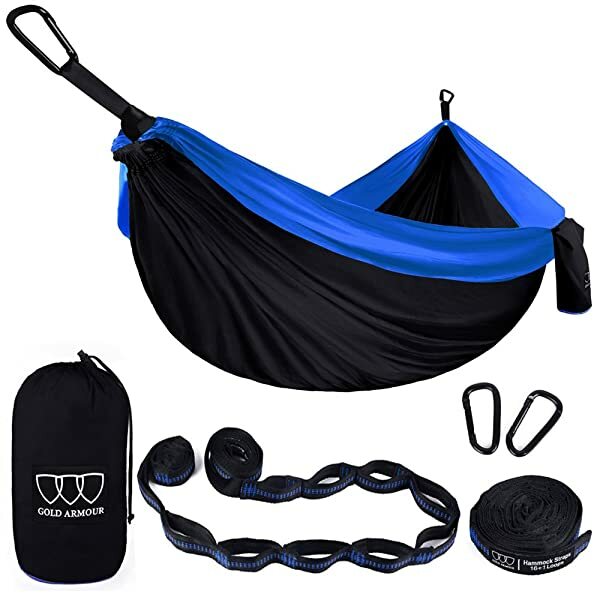 This hammock is multifunctional as you can also use it as swing, cradle, yoga mat, and ground mat. You can hang it easily almost anywhere since it comes with all the necessary components. The 210T parachute nylon is strong, breathable and very durable. The fabric does not fade easily, and it is easy to clean and also dries quickly. It is available in various and beautiful color combinations. FARLAND offers a 90-day money refund guarantee for this hammock. The knots can be hard to figure out in case they get undone. Some users complain that the single hammock is not spacious enough. The stitching needs some improvement to make it more durable. The FARLAND Outdoor Camping hammock is for someone that wants something that will remain in good shape for a long time. It comes in single and double sizes, and the company makes it with a 210T parachute fabric that is breathable, durable and lightweight. Both sizes are quite spacious and can withstand a lot of weight. 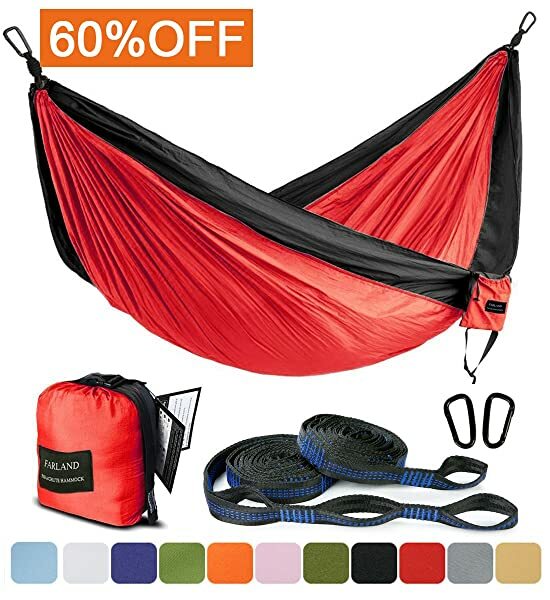 The hammock comes in various colors, and all are anti-fade. When you buy it, you will also get two carabiners and two straps to ensure you have everything you need for immediate use. Material: FARLAND uses a 210T parachute nylon material to make this hammock. This material is lightweight, strong and very durable to ensure that you get to enjoy this product for many years. The fabric has four levels of color fastness, and so it will not fade. It is also easy to clean, and it dries quickly. Size: The single hammock is 55 by 106 inches which is quite spacious while the double one is 78 by 118 inches which makes it possible for two adults to share it. And it weighs 1.8 pounds only. Accessories: When you buy either of the two sizes you will get two tree-friendly straps and two carabiners with a flat mouth to ensure they do not damage the straps. The hammocks also come with a beautiful gift box. Colors: There are close to a dozen color combination available, and they include black/red, blue/grey, brown/olive and khaki/grey. 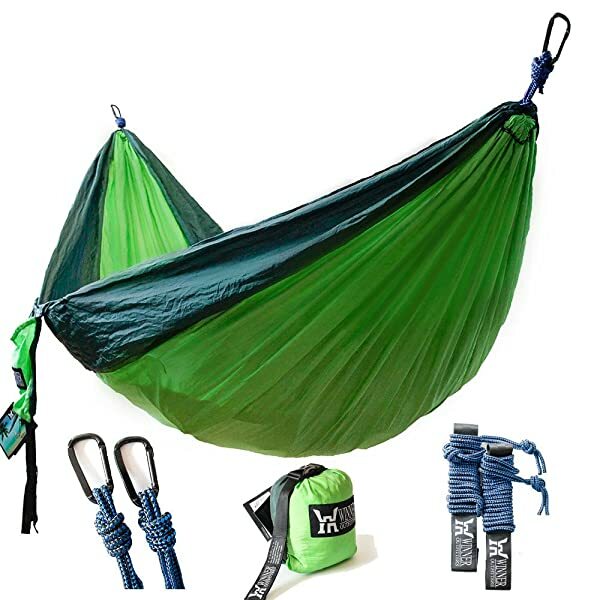 The FARLAND Outdoor Camping hammock is just all you need for your camping and backpacking trips or even for relaxation in your backyard or the beach. 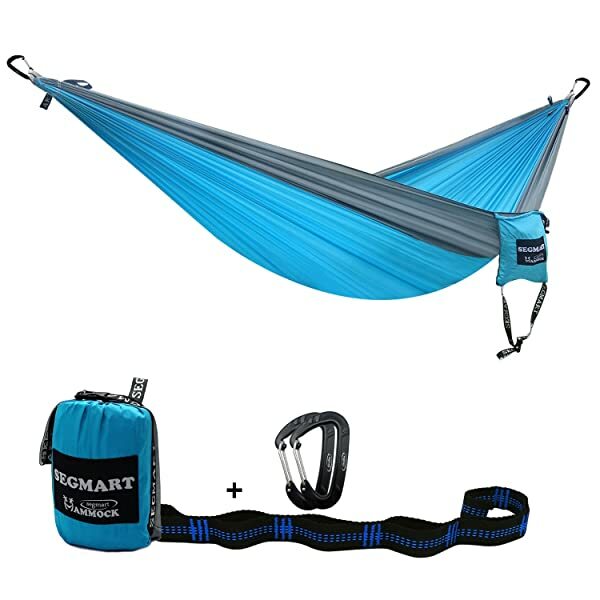 It is a high-quality 210T parachute nylon hammock that comes with everything you need to set it up. And you can hang it in a few minutes and put everything back in the sack also very quickly. The fact that you also get to choose from several colors and that the colors will not fade also adds to its positive traits. 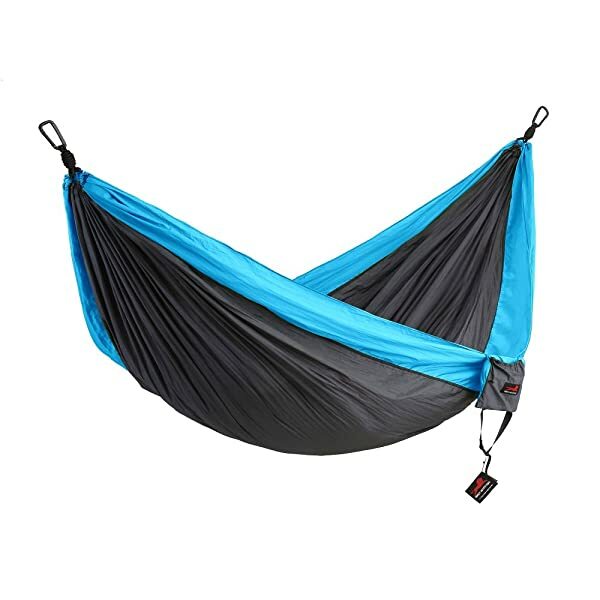 The company makes it in single and double sizes to cater for the needs of all customers, but both hammock sizes can withstand a lot of weight. And it is one of the few hammocks out there that does not have any significant flaws. If you are in the market for something comfortable and easy to carry this will be an excellent buy.